Spring is here and while we highly recomend leaving chemicals, plumbing, and electronics updates to us, here are some things that you can do to get your pool ready for summer. Unless it was emptied for mainteance or winterizing by our staff, you should never empty your pool without making sure it is ok. While many pools will be ok – other owners in lots with high water tables may actually find that the pool will shift in the ground or actually begin to float as the downward pressure from all that water is removed. Unfortunately, by the time you’ve discovered this problem the damage is probably already done. It’s likely that through evaporation or possibly seepage that you’ve lost some water in the pool over the winter. You can top it off to the proper levels and while doing so, make sure to check the filter by removing the cartridge and wash it thuroughly. Depending on the type of pool filter you have though, there may be different steps involved. Pool chemicals can be tricky and it is often best left to the profesionals since we have the experience with ensuring the perfect balance that allows the chemicals to kill harmful bacteria and parasites while keeping your family healthy. In general though, your pools PH level should be 7.2-7.4, alkalinity between 80-120, and calcium hardness between 150-250 ppm (parts per million), and chlorine should be between 1-3 ppm. These are tests that you can run yourself but we encourage our clients to call us to add the chemicals as when it is done improperly, too much or too little can damage pool equipment, your health, or simply not be effective at cleaning the pool. Even with a great pool cover, it’s likely that you’ll have some debris that has entered the pool or maybe is stuck in the filters and intakes from last year. Do a walk around of the pool and take your net and clean up anything that is floating on the surface or in the filters. Additionally, make sure you’ve vacuumed all the leaves and debris that may have settled on the bottom. It’s possible that mold or organic material may have grown on the stones and patio surrounding the pool. You’ll want to make sure this area is completely clean as well as to prevent any potential slippage when the surface gets wet. The ground can shift over the winter as frozen mud heaves and then sags again so it is important to test out your pool fences, gates, and locks to make sure that they still function properly to keep animals as well as kids away from your pool when there is no supervision. No one wants to be the one to discover that their grill doesn’t light when friends are already over and ready for the first BBQ of the summer. When you are doing your early spring pool inspection, make sure to test out the grill, fire pit, and fire bowls at the same time. Just like appointments and supplies for pool openings, outdoor kitchen supplies and service are going to be in high demand the closer to Memorial Day that you get. When we come out to perform a pool opening, our team will always do an inspection to look for potential maintenanceissues. However, you will always know your pool better than we will so if there are any issues that you notice during your inspection, this will help us be more effective. The sad reality is that once the warm weather hits, everyone will want their pool open and ready to enjoy. 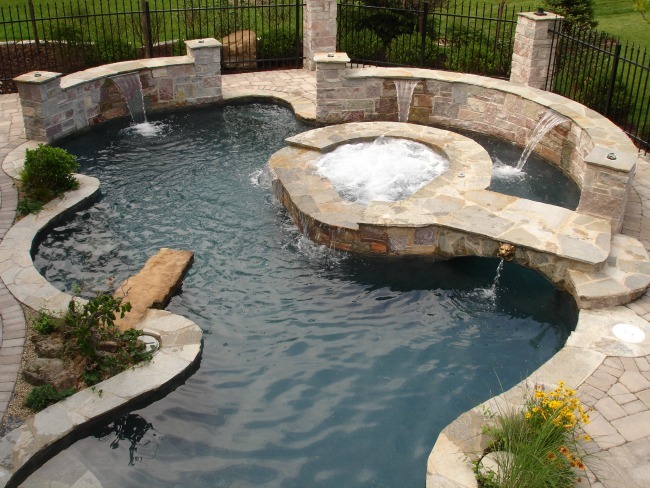 However, if you plan ahead and start the spring pool opening process before summer arives then your pool will be ready when others are still struggling to schedule an appointment. Most importantly – remember that while opening the pool is never fun, this is a critical process that will set the tone for the rest of the summer. Spend the time and effort now and you’ll be relaxing and enjoying the pool the way it was intendend for the whole rest of the summer!